Two Libyan Air Force Mirage F.1s, armed with rocket pods, landed in the afternoon of Feb. 21, 2011, in Malta. The two aircraft were piloted by two senior officers who claimed to have defected after being ordered to bomb civilians who were protesting in Benghazi. According to the information collected from many sources, the two aircraft had taken off from Okba Ben Nafi airbase near Tripoli and landed at Benghazi, where they were refueled and armed. After taking off from Benghazi, the two Colones, were ordered to fire at protestors (multiple aircraft strikes against protestors caused 250 deads) hence they decided to defect, descended low level (someone reported they escaped at 50 ft above sea level) and headed towards Malta. Approaching Malta, they made contact with Maltese ATC using radio callsign Mirage 1 and 2 (serial 502 and 508), declared fuel emergency and landed, seeking asylum from the Maltese authorities. Upon landing, they were surrounded by local police forces. The two fighters arrived shortly after two civilian Pumas that had already landed at Malta International Airport. The choppers (F-GHOY and F-GYSH), belonging to Heli Union and usually stationed at Tripoli International Airport, carried 7 French passengers evacuated from Libya, of whom, only one was carrying a passport. The most interesting pictures of the arriving “visitors” that I’ve found so far are those available at the following address here. Don’t you think the Mirages (especially 502) are cleaner than one would expect? Malta is currently the temporary base of an Austrian AF C-130 used for shuttle flights from Luqa to Tripoli aimed at evacuating civilians. Italian citizens will be evacuated from Feb. 22, with special Alitalia flights. As a consequence of the defection of the two Libyan Mirages, Gioia del Colle, home of the F-2000s of the 36° Stormo, and Trapani, where the F-16s of the 37° Stormo of the Aeronautica Militare (Italian Air Force, ItAF) are based, were put in a heightned alert status. 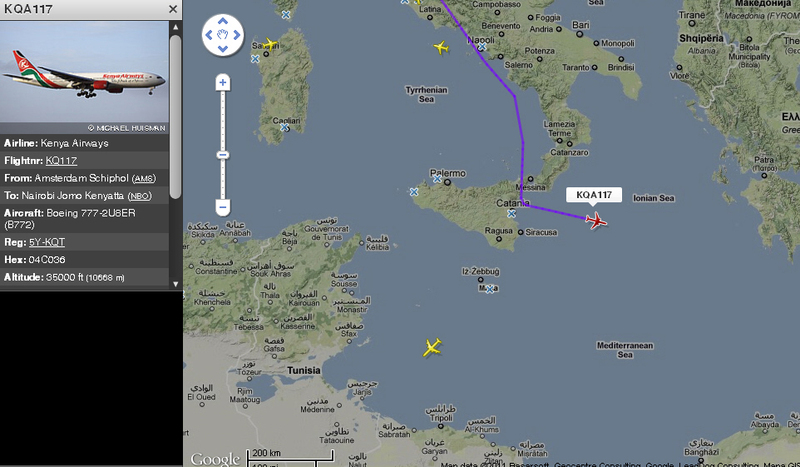 According to rumours, Italian Air Force is about to move helicopters to the most southern bases (Lampedusa? Pantelleria? To do what? Maybe Search And Rescue or surveillance of the waters surrounding the islands where refugees are arriving by sea). Around 21.30LT Benghazi airspace was closed; consequently, all the south bound air traffic was compelled to change the preplanned route. The following screenshot taken from Flightradar24 shows the Kenya Airways flight KQ107 changing its route to avoid entering the Libyan airspace enroute to Nairobi. Even if rumours in the past days claimed Colonel Gaddaffi had left for Venezuela, his current location is unknown. None of the aircraft usually used by the Libyan President (mainly A340 with registration 5A-ONE, but also Falcon 900 or Beech 200) were spotted/monitored leaving Libya in the last two days.